Psychology has influence in almost every walk of life. Originally published in 1997, A Century of Psychology is a review of where the discipline came from, where it had reached and where the editors anticipated it may go. Ray Fuller, Patricia Noonan Walsh and Patrick McGinley assembled an internationally recognised team of mainly European experts from the major applications and research areas of psychology. They begin with a critical review of methodology and its limitations and plot the course of gender and developmental psychology. They go on to include discussion of learning, intellectual disability, clinical psychology and the emergence of psychotherapy, educational psychology, organizational psychology, cognitive psychology, neuropsychology and many other topics, in particular community psychology, perception and alternative medicine. 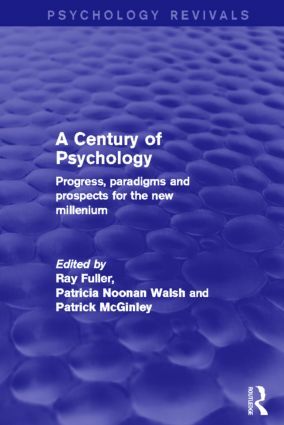 Enlightening, reflective and sometimes provocative, A Century of Psychology is required reading for anyone involved in psychology as a practitioner, researcher or teacher. It is also a lively introduction for those new to the discipline. Brown, Heisenberg and Lorenz: predecessors of twenty- first-century psychology? Community psychology: a new Gestalt psychology?